Brian Vickers will drive a special #11 FedEx Delivery Manager Toyota in Saturday night’s race at Richmond International Raceway (RIR). FedEx Delivery Manager, which launched earlier this week, provides delivery options for FedEx residential package recipients to fit their schedule. It offers personalized options that allow customers to request how, when and where they want their packages delivered. FedEx Delivery Manager can be used online, through mobile browsers and with the FedEx app. Vickers has 14 career Cup Series starts at RIR, most recently in September 2011. The 29-year-old has posted three top-10 finishes at the three-quarter-mile track, including a seventh-place result in 2007. Vickers has captured two poles at RIR, in 2004 and 2009. Despite a back injury that will force Denny Hamlin to sit out this weekend’s racing activities at Richmond, the Chesterfield, Va., native will still play host to his late model charity race, the Denny Hamlin Short Track Showdown presented by FedEx, Thursday night near his hometown. 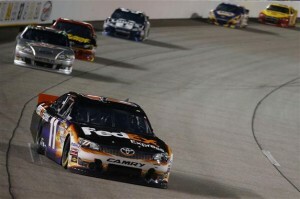 The race is in its sixth season, and proceeds from the race benefit the Denny Hamlin Foundation. Matt Kenseth, Kyle Busch and Tony Stewart highlight a list of NASCAR stars that will battle against local short track racers in the 75-lap race that is broken into two segments. The race will take the green flag Thursday night at 8:30 p.m. ET, and will be broadcast live on MRN radio. Vickers finished 31st in last Sunday’s NASCAR Sprint Cup Series race at Kansas Speedway, soldiering on after contact with the wall damaged the #11 FedEx Freight Toyota Camry enough to require two extra pit stops for repairs but still running when the checkered flag was waved. Like every other driver, Vickers was racing on a newly-resurfaced Kansas Speedway mile-and-a-half track for the first time in the Gen 6 car. His practice and qualifying sessions had shown consistency and stability so Vickers, again substituting for Denny Hamlin, was optimistic after qualifying in 16th position, with his Joe Gibbs Racing teammates Matt Kenseth and Kyle Busch starting from pole and fifth on the grid respectively. The first half of the race saw a flurry of cautions providing crew chief Darian Grubb plenty of opportunities to try and loosen up a tight handling car. However, following a green flag pit stop on lap 165 for four tires and a left rear track bar adjustment, Vickers returned to the track for 10 laps, only to bring out a caution after hitting the wall hard coming off turn two with significant harm to the right side of his race car. The FedEx Ground Western Rockies district will be recognized for outstanding performance in all areas of the operation with its district code “WROK” on the b-post of the #11 FedEx Delivery Manager Toyota this weekend at Richmond International Raceway. The Western Rockies district extends from its Salt Lake City hub to include most of Idaho, Nevada and Utah.